The longest free flowing river in Oregon, the John Day River runs 280 miles from the Blue Mountains in central Oregon to the Columbia River. A little more than half of the river is designated Wild & Scenic. A true family Bass fishing experience to be remembered for years to come! Our float covers 35 to 58 miles of prime smallmouth bass habitat. Carbone's Fly Fishing has offered guided flyfishing trips on the Deschutes River since 1986 as well as trips on the John Day and Crooked Rivers. Our John Day River Expedition encompasses class 2 and 3 rapids, fishing for steelhead, salmon and bass as well as birdwatching and gorgeous scenery. Great for families! "Get your Fish On" with Mid Columbia River Guide Service. Bring your enthusiasm, fishing license and clothing and we'll provide the gear, boat and captain. Running April through October, OWA has been guiding trips for over 25 years! Families and children over 6 are welcome to join the fun. Ask about our gift certificates. What can I do and see along the John Day River? Rafting along the John Day River offers scenic vistas, good fishing, great access to hiking trails, and a few fun class II rapids. This easy river is great for families but it requires a few overnights. Rafting trips are typically enjoyed either along the upper run (between Service Creek and Clarno) or along the lower section (between Clarno and Cottonwood Bridge). Both trips are multi-day, ranging between 4 and 5 days, and offer a variety of scenic flat water sections as well as a few fun small rapids. The upper section is typically calmer than the lower. The rafting season typically spans from early May through late June. 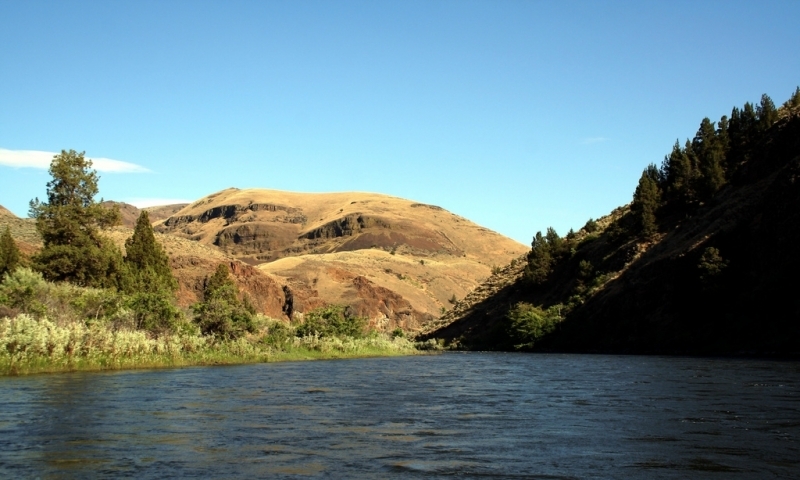 The John Day River is known for excellent smallmouth bass fishing. During the spring, it is also home to one of the larger wild Chinook salmon populations. The best fishing can be enjoyed when the water clears in June. Just outside of Clarno, Oregon, where the river heads north, the John Day Fossil Beds offer an interesting side trip. The vivid colors and interesting fossils can be easily spotted via hiking trails and ranger programs. More info. Where is the John Day River? The main fork of the John Day River runs 280 miles from the Blue Mountains (in central Oregon) to its confluence with the Columbia River. River trips are typically divided into two sections, the upper and lower. The upper run spans from Kimberly to Clarno, Oregon, while the lower section spans from Clarno to Cottonwood Bridge near Sherman, Oregon. Because the John Day River is free flowing, water levels are highly dependent on snowmelt. The rafting season typically spans from early May to late June. You can continue to fish later into the summer. Most visitors enjoy the John Day River via guided mulit-day rafting trip. There are a number of guides and outfitters that run this river and prices vary per outfitter. You’ll also need an Oregon fishing permit to fish these waters. Contact the local BLM office in Prineville at (541) 416-6700 or read about John Day River Permits and Trips.